Discussion in 'Bukkit Tools' started by Tiiffi, Apr 16, 2012. I noticed that there is no proper and working console based rcon client for minecraft servers available so I wrote one. I thought it would be nice to share it for the joy of the poor server admins without proper administration tools. "Launch script" and "Create shortcut script" added to Windows binary package. Please report any compiling problems to my mail. Stay tuned for new features and bug fixes! Naturally I would appreciate any feedback including bug reports and feature requests. You can also submit bug report tickets in sourceforge. Mcrcon is powerful minecraft rcon client / terminal with bukkit coloring support. It is well suited for remote administration and to be used as part of automated server maintenance scripts. It does not trigger "IO: Broken pipe" or "IO: Connection reset" spam bug on server side. Send multiple commands in one command line. Terminal mode. Keeps the connection alive so need for authing all the time. Silent mode. Does not print rcon output. Support for bukkit coloring on Windows and Linux (sh compatible shells). Multiplatform code. Compiles on many platforms with minor changes. Fixed bug causing crash / segmentation fault (invalid write) when receiving malformed rcon packet. Program makes use of C99 feature (variable-length arrays) so "-std=gnu99" flag on GCC-compiler must be used to avoid unecessary warnings. Rcon receive buffer is now bigger (2048 bytes -> 10240 bytes). Thanks to 'gman_ftw' @ Bukkit forums. Fixed invalid error message when receiving empty rcon packet (10 bytes). Thanks to 'pkmnfrk' @ bukkit forums. Terminal mode now closes automatically when rcon socket is closed by server or if packet size cannot be retrieved correctly. Client now tries to clean the incoming socket data if last package was out of spec. Reverted back to default getopts options error handler (opterr = 1). Custom error handler requires rewriting. Some comestic fixes in program output strings. Program usage(); function now waits for enter before exiting on Windows. Colors are now supported on Windows too! Terminal mode is now triggered with "-t" flag. "-i" flag still works for backwards compatibility. Bug fixes (Packet size check always evaluating false and color validity check always evaluating true). License changed from 'ISC License' to 'zlib/libpng License'. Interactive mode (-i flag). Client acts as interactive terminal. Program return value is now the number of rcon commmands sent successfully. If connecting or authentication fails, the return value is -1. Colors are now enabled by default. Now '-c' flag disables the color support. Added experimental support for bukkit colors. Should work with any sh compatible shell. -s      Silent mode. Do not print data received from rcon. -t      Terminal mode. Acts as interactive terminal. -p      Rcon password. Default: none. -H      Host address. Default: none. -c      Do not print colors. Disables bukkit color printing. Invidual commands must be separated with spaces. lastern, MrVasyanich and Thasan like this. Nice! I will download it! It is console based client with textual user interface. It is intended to be used from OS console. Launch it from windows commandline or create .bat file with correct launch options. The file extension must be .bat so that windows knows its batch script ("launch.bat" for example). This .bat file acts as "shortcut" to connect to your server rcon. UPDATE: New launch script available for Windows users. Launch script and Create shortcut script added to windows binary bundle. Check Windows binary package README.txt for more information. Have you tried to compile it on Mac? Its posix compliant code so it should compile on Mac without any problems. Color support may not be working but you can use "-c" flag to disable colors. "Official" Mac support in progress.. (I dont have Mac machine available at the moment). Hey, this is great timing since I was just looking to implement rcon! However, I have a problem. Whenever I issue a command, like "say test" or "op someone", I get an error saying "Unknown command "say test". Type "help" or "?" for help.". However, in the log, it appears that the command succeded ("[RCON] test"). This happens in both command line and interactive mode. What version of Minecraft server you are using? There might be something I have missed in the way of things on Vanilla minecraft server. For example, Vanilla server does not format its rcon output so there is no newlines at all. Edit: I just noticed that Vanilla server sends emtpy packet (length 10) with correct packet id when command is executed succesfully. No textual output at all. I will fix this "cosmetic" problem in next release (0.0.5). Thank you pkmnfrk for the bug report. Whoops, I suppose that on a bukkit forum I really should specify that I am not using bukkit! I'm running a server with a few other mods (IC2, BuildCraft, etc), but it is the latest vanilla 1.2.5 server. If its possible, I could use some network traffic dump captured in pcap format. But I think I already know the problem so traffic analyzing is propably not needed at the moment. But hmm .. Am I blind or something? Cant see any zipped packages in your post? You could send me a private message so there would be no risk of exposing possibly private data to public. I totally attached it to the post... whatever, that's a better idea. PM incoming. Before I say anything, great utility, really the rcon utility on minecraft forums is nothing compared to this! However I am encountering a specific problem for the past hour, whenever I try to send a command that sends back a lot of text (eg. pex group Admin, dynmap, etc.) it gives me the following: "Warning: invalid packet size <4106>. Must be over 10 and less than 2048." Now after that any command which I send it repeats the warning no matter what command is like ?, list, etc. In order to "reset" it I need to restart the application and then it works fine (providing that I don't enter the pex group Admin command and such similar commands like dynmap again). Thank you for the problem report! What are the biggest packages you are getting from the server and what exact commands triggers them? Apparently the command sends quite a big packet to the rcon client. This problem will be fixed in the next release which will be ready in few days. Does the windows version work on a 64-bit? I has just finished Android port of it. *  appreciated but is not required. *  misrepresented as being the original software. *  Mcrcon is powerful minecraft rcon client / terminal with bukkit coloring support. *  It is well suited for remote administration and to be used as part of automated server maintenance scripts. *  Does not cause "IO: Broken pipe" or "IO: Connection reset" spam in server console. *  - Interacive terminal mode. Keeps the connection alive. *  - Send multiple commands in one command line. *  - Silent mode. Does not print rcon output. *  - Support for bukkit coloring on Windows and Linux (sh compatible shells). *  - Multiplatform code. Compiles on many platforms with minor changes. *    GCC-compiler must be used to avoid unecessary warnings. *  - Rcon receive buffer is now bigger (2024 bytes -> 10240 bytes). *    * Thanks to 'gman_ftw' @ Bukkit forums. *  - Fixed invalid error message when receiving empty rcon packet (10 bytes). *    * Thanks to 'pkmnfrk' @ bukkit forums. *    or if packet size cannot be retrieved correctly. *  - Client now tries to clean the incoming socket data if last package was out of spec. *  - Reverted back to default getopts options error handler (opterr = 1). *    Custom error handler requires rewriting. *  - Some comestic fixes in program output strings. *  - Program usage(); function now waits for enter before exiting on Windows. *  - Colors are now supported on Windows too! *    check always evaluating true). *  - License changed from 'ISC License' to 'zlib/libpng License'. *  - Interactive mode (-i flag). Client acts as interactive terminal. *  - Program return value is now the number of rcon commmands sent successfully. *    If connecting or authentication fails, the return value is -1. *  - Colors are now enabled by default. Now '-c' flag disables the color support. *  - Added experimental support for bukkit colors. *    Should work with any sh compatible shell. *  - Packet string data limited to max 2048 (DATA_BUFFSIZE) bytes. *    No idea how Minecraft handles multiple rcon packets. *    If someone knows, please mail me so I can implement it. *  - Follow valve rcon protocol standard strictly? *  - Multiple packet support if minecraft supports it?! *  - Investigate if player chat messages gets sent through rcon. *    If they are, the messaging system requires rewriting. * Bug reports and feature requests to tiiffi_at_gmail_dot_com. "Sends rcon commands to minecraft server.\n\n"
"  -s\t\tSilent mode. Do not print data received from rcon.\n"
"  -t\t\tTerminal mode. Acts as interactive terminal.\n"
"  -p\t\tRcon password. Default: \"\".\n"
"  -H\t\tHost address or ip.\n"
"  -c\t\tDo not print colors. Disables bukkit color printing.\n"
It has just 1 differens from original code: you set your particular IP address and port and it will automaticaly log in to your server in terminal mode, but also you can change IP and port as a "tag" (like it was at original version). 4. C4Droid + GCC plugin (in the c4droid settings you need select compiler: "GCC + Bionic"). So you just compile that code, go to the folder: /data/data/com.n0n3m4.droidc/files/temp and copy file "temp" to your sdcard or other folder. After that you go to the terminal input: "/mnt/sdcard/temp" or full path to that file. You also can try myself-build binary (just copy it to SD card and input "/mnt/sdcard/temp" in the terminal (if your sd-card is mounted to the "sdcard" folder). Is it possible to have info shown? Like player left and join? Sorry for the delay with new release. I have been busy with other projects but now I am getting back with this. Yes it works on 32bit and 64bit Windows NT systems. The app is so small so basically 64bit version is "worthless" anyway. Nice. Cool project. I was thinking of making Android port of the app but I think I need some Android "specialists" to help me. Is there any other way to compile C on Android systems or do I have to rewrite the app in Java to get it more accesible for people. I think Minecraft server has some inbuilt restrictions for some of the commands. Not sure if its possible to enable them by modifying the server config files. But doesnt look too helpful for your particular problem. Minecraft implentation of rcon doesnt send all the console input to rcon unfortunately. You probaly need some third party plugin implementation of admin console to get the desired features. I really think they should improve the rcon useability and features. As soon as I get them compiled. In fact the 0.0.5 version sourcecode has been available online for a few months now. I think I will upload the precompiled binaries in a week or so. I am researching that possibility but looks like Minecraft rcon implementation doesnt send that information to the rcon client. But this needs some work and checking. It will be implemented if possible! I'm not sure if I'm doing something wrong or there are some settings I am missing. When I try to connect to my server it succeeds and says "Logged in. Type "Q" to quit!". As soon as I try writing/executing a command, it just goes "Connection lost." and throws me out. Running Bukkit 1.2.5-R4.0, get back to me if you need more information! What commands you are trying to execute? Also does it happen when you send the command without -t flag (terminal mode)? And did you try the 0.0.4 version? I "fixed" the connection logic in 0.0.5 version so there might be weird bug somewhere hiding. I tried the 0.0.4 version first, and got the same problem but didn't get disconnected instantly (did happen on the second command, first command just says "connection lost" but doesn't break the connection)! I just tried executing a "?" to see what I would be able to do. Also tried /help and /? but to no avail. Seems like I'm able to execute commands without the -t flag. EDIT: Just saw that doing the connection without -t flag (just running the command) kind of gets rcon on the server stuck in a loop or something. Java.exe takes 100% cpu after 3-4 commands (did "?" 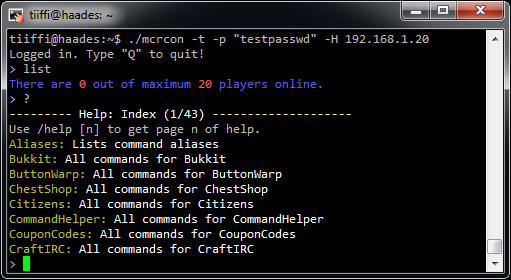 as a command all the times) via mcrcon, is this something with bukkit/minecraft or with mcrcon 0.0.5? Okay. Thanks for the report. I think this need some research to be done. I havent got any other reports on this kinds of problems but I know bukkit team has done some changes to rcon stuff so it might be the cause of these problems. This was well known problem in older Bukkit versions. I thought they already fixed it as the bugtracker page says: "Fix Version/s: CraftBukkit 1.2.5-R4.0". Not sure if there is a new bug now or is this old bug still appearing. Does the server say something when it gets into the loop? This issue also needs some research. So thanks again for the updates and stay tuned! ./mcrcon -p <password> -H 192.168.11.20 -P 25572 "say Fogel testing :3"
I realized that the java.exe process was spiking up at like 25% CPU usage per command I sent via mcrcon and when I saw that the usage didn't lower from 100% at all I tried rebooting bukkit and sent the commands again to confirm that it was rcon. Can you capture a packet log of your rcon sessions? I could use that information. Wireshark does the job on windows and tcpdump on Linux. The packet log should be in .pcap format. It would be good if you could catch the log when something unexpected happens. If you are going to capture the traffic, remember to use different dummy password in you traffic or remove the real password from the capture log afterwards before posting it online.